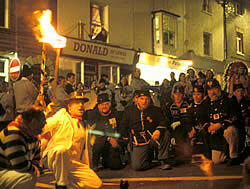 Bonfire Prayers at Commercial Square, showing some of the Second Pioneers. Headquarters: Elephant & Castle P.H. Commercial Square's pioneer front and society emblem were born out of protest, rather like the Bonfire tradition itself. During the late 1800s a handful of society members went to America to find their fortune helping to construct the ever-expanding railways. 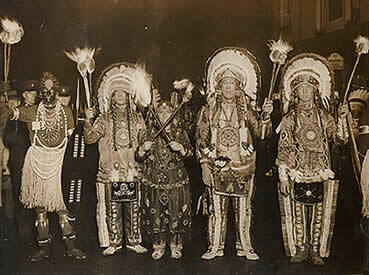 During their time there, they observed the dreadful treatment of the Native American population. 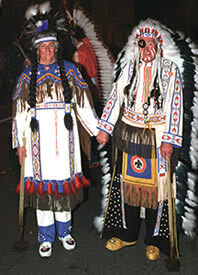 Upset by what they saw, upon their return to Lewes, they decided to wear North American Indian costumes to raise the profile of the Native Americans' plight. This costume was so popular that it did not take long before the Indian motif became the society's leading costume and our emblem.